Looking for long term storage? Moving to another country? Moving into an apartment? Travelling abroad? If this sounds like you, we have a simple storage solution to meet your needs. Spaces Storage offers affordable long term storage with easy access and hassle free delivery and pick-up. We drop the unit at your location; you pack the items yourself at ground level. No rush, no stairs, no car or truck needed. After you have packed the vault we will pick it up and store it at our secure facility. If you’re moving just give us the new address and we will return the vault to your new home for you to unpack. Only need short term storage? That’s no problem. We can leave the vault on your property or return it to our facility until you need it back. We are just a phone call away. 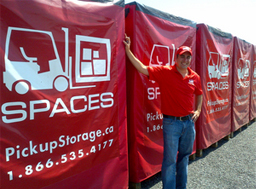 At Spaces we know there are many options for both long term and short term storage in the Kingston area. That’s why we strive to make you 100% satisfied with our storage solution. We know you value your possessions and so do we; that’s why your belongings are stored in a secure location.